The analysis timeline is critical in winemaking to assure the quality of the finished product. Discrete Analyzer systems assure fast, reliable and repeatable results by utilizing specific enzyme reactions, and robust robotics to streamline laboratory analysis during critical times of the year, like harvest. We will discuss the principles of photometric analysis, important parameters to analyze in grapes and wine, and how a Discrete Analyzer is used in a wine laboratory. 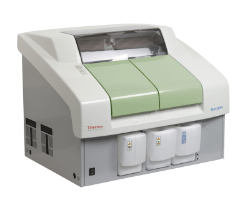 Bring excellent analytical performance to colorimetric, enzymatic and electrochemical measurements with the Thermo Scientific™ Gallery™ Automated Photometric Analyzer. With a compact and affordable design, this discrete analyzer covers a wide range of application areas including food, beverage, water, soil and bioprocess testing and quality control.